For the team at DC Structures, building relationships is just as important as helping customers build their dream barn or barn-style home. We take pride in the quality of our product and service offerings, making client connections a priority both during and after completion of their projects. One of the many benefits of maintaining an open and honest line of communication with our customers is that they are happy to share their thoughts about what it’s like to work with DC Structures. We can sing our own praises for days, but we know the most valuable insights will always come from clients themselves. The apartment barn is an efficient structure that makes good use of space with its hybrid design. Combining home with hobby, our apartment barn kits offer the benefit of bringing you closer to the things you love the most. Not to mention a reduced carbon footprint! This sustainable apartment barn in Cornelius, Oregon boasts two horse stalls and two dog kennels on the ground floor, and a cozy living space upstairs. Modified from an Oakridge 36’ apartment barn kit, this functional and attractive structure boasts an array of energy-efficient upgrades. Skylights optimize natural lighting for the upstairs living quarters while a solar panel and electric car charging station reduce energy consumption. 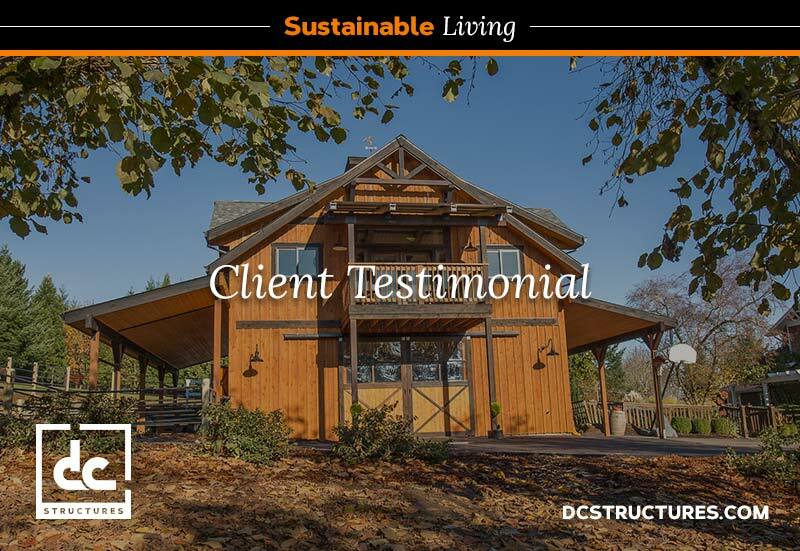 Hear what the owners of this sustainable apartment barn have to say about working with DC Structures in the apartment barn testimonial below! Thinking about an apartment barn for your own property? Request our digital catalog and get started on your dreams today!